Yumi la Rosa’s flamenco path started when she decided to follow her passion instead of staying in her established accounting career. She left for Spain to study with well-known Flamenco artists such as Rafaela Carrasco, Juana Amaya, Belen Maya, Leonor Leal, Isabel Bayón, “La Truco”, and others. 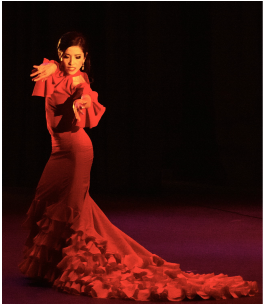 Upon returning to Phoenix, Yumi joined Viva Flamenco directed by Lydia Torea as a company dancer, and later became a soloist with Mosaico Flamenco at Hyatt Gainey Ranch Scottsdale Resort. Yumi was also selected as a soloist with the prestigious touring group, Calo Flamenco, directed by Martin Gaxiola. She was later invited to Mexico, India and Singapore to teach Flamenco workshops and to perform. Currently, she is performing at Tapas Papa Frita Spanish restaurant in Scottsdale as a featured dancer. Yumi has been teaching flamenco for all ages throughout the valley to introduce the art of Flamenco. In 2009, she founded her own group, Yumi La Rosa Flamenco Dance and presented her very first dance production calledMujeres at Tempe Center for the Arts. The production has been growing each year featuring invited artists from other dance disciplines in addition to her own group. Yumi created Mujeres to give the public an appreciation of other cultures in general and of the richness of Spanish culture in particular.